It is a clean and nice motel, great pool and breakfast. 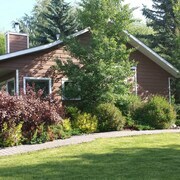 The best place to stay in Strathmore. This is my 4th stay here but my first one in a pet friendly room. Although it is still a nice room, there were a few obvious pee stains on the carpet, the blackout blinds have rips (likely from a big dogs nails) and the shower curtain had at least 6 holes in the top portion. I realize the pet rooms will be a bit more banged up and I will continue to stay here when I come through town. Where to find Strathmore hotels near an airport? Where can I find hotels in Strathmore that are near tourist attractions? So, are you traveling in Southern Alberta and are looking for a room in the Strathmore area? Within easy driving distance of the downtown area, you can find 6 Expedia-listed hotels. 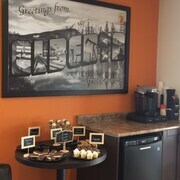 If you would like to book accommodation within a short drive of the center of Strathmore, the Days Inn and Suites Strathmore could be the best place to check out. 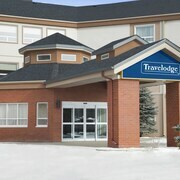 4 kilometres (2 miles) away from downtown Strathmore, is the Travelodge Strathmore AB. 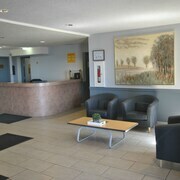 The Best Western Strathmore Inn is positioned 4 kilometres (2 miles) away. More alternatives around Strathmore are the Super 8 Strathmore and the Wheatland Hotel. If you have time left, you should see more of the Southern Alberta region. Southern Alberta offers rivers, streams, lakes and mountains, and commonly visited Southern Alberta attractions include old towns. In this part of Canada, tourists might try their hand at snowboarding and skiing. Spend a few hours enjoying the Deerfoot Casino and the Blue Devil Golf Club in Calgary South - MacLeod Trail, 50 kilometres (31 miles) to the west of Strathmore. 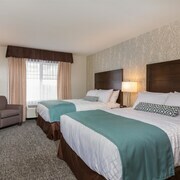 If you'd like to visit Calgary South - MacLeod Trail, check out the room rates at the Deerfoot Inn & Casino and Service Plus Inns & Suites Calgary. 50 kilometres (31 miles) to the west of Strathmore is Downtown Calgary, which is home to the Hotel Le Germain Calgary and Kensington Riverside Inn. Should you choose to stay in Downtown Calgary, set aside a little time to visit the BMO Centre and CORE Shopping Centre. 50 kilometres (31 miles) to the west of Strathmore is Calgary, a regional center with a population of 1,000,000, and the home of places to see like the Calgary Tower, the GRAND and Stanley Park. The Peace Bridge and the Calgary Zoo are also worth investigating. Should you wish to stay in Calgary, be sure to check the latest deals at the Hotel Le Germain Calgary and Kensington Riverside Inn. For travelers arriving or departing through Calgary International Airport, you may choose to book some accommodation at Best Western Premier Freeport Inn & Suites, or Residence Inn by Marriott Calgary Airport, both of which are a short distance away. This former hamlet is the kind of place where families live, work, and play. Many people who live here commute into Calgary during the day. This means you’ll have freedom to roam the town and enjoy long lunches during a weekday visit. You can relax and play at a number of great parks and commercial farms while you’re here. Hotels in Strathmore have earned reputations for being exceptionally cozy and inviting to outsiders. Daytime temperatures in the summer stay near 24 degrees Celsius. Winter days usually experience freezing temperatures. However, warm winds often provide breaks from chilly conditions at various points throughout the season. The region enjoys some of the longest hours of annual sunshine in all of Canada. Whether you want to soak up some sun on the prairie or watch the sun go down over a landscape of sparkling snow, you’ll love the beauty that can be found right outside Strathmore hotels. This is the place to come when crowded attractions and hype are the farthest things from your mind. Come here when you’re in the mood to tour a winery or spend a day at a golf course. Local orchards and farms offer plenty of family-friendly fun for you to enjoy. If you visit during August, check out the Strathmore Heritage Days and Stampede. Of course, Calgary’s bright lights are always only a short drive away. 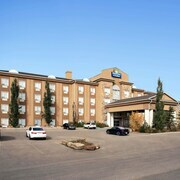 We’re here to give it to you straight about cheap rates on Strathmore, Alberta hotels. 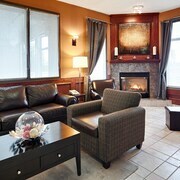 You’ll be pleased to know that some of our top deals include fabulous accommodations and cheap flights to Strathmore. Talk to our travel experts about bundling all your travel needs for one great price. You'll be surprised to learn that planning a holiday away from home doesn't have to conflict with your budget. Hurry to get the guaranteed best vacation rates from Expedia today. Are there hotels in other cities near Strathmore? Explore Strathmore with Expedia.ca’s Travel Guides to find the best flights, cars, holiday packages and more!